View this info if your Note8 is frozen or unresponsive. Este dispositivo tiene una batería no extraíble. This process can be used to simulate a "battery pull" when the device is frozen or unresponsive..
Press and hold the Power and Volume Down buttons until the device powers off (approx. 10 seconds). Allow several seconds for the Maintenance Boot Mode screen to appear. 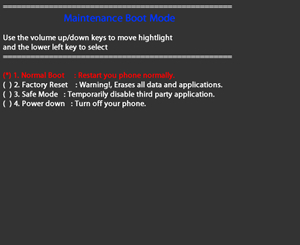 From the Maintenance Boot Mode screen, select Normal Boot. Utilize the volume buttons to cycle through the available options and the lower left button (on the left edge; below the volume buttons) to select. Espera hasta 90 segundos para que se complete el restablecimiento.